The superstars of business get big play in today's Buffalo News Business Today section. It's been nearly 40 years since John Lennon, Paul McCartney, George Harrison and Ringo Starr announced their breakup, but the new game and discs caused a worldwide buzz as the Beatles returned to the top of the charts in Britain, the land where it all began. Jobs, who had a liver transplant this spring from a young adult who died in a car accident, got a vigorous standing ovation from many in the audience. Looking thin and speaking quietly and with a scratchy voice, the 54-year-old CEO urged everyone to become organ donors. 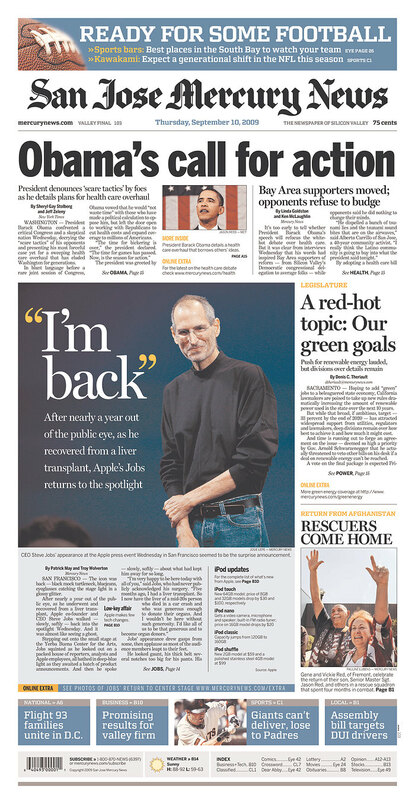 “I wouldn’t be here without such generosity,” Jobs said. The 19 wins consist of 810 pledged new jobs and 544 retained jobs, for a combined total of 1,354 jobs, BNE officials said. The projects add up to a pledged investment of $336.8 million, a figure dominated by the $300 million associated with a Yahoo! data center planned for Niagara County. And, oh, yeah, the Fed says the recession is sort of over.